Masizzim Singapore @ 313 Somerset ~ A New Korean Restaurant That Serves Delicious Meat Stew! Some people surely possess business acumen and discerning tastes when it comes to identifying good food! After bringing in Chir Chir, the popular Korean fried chicken joint into Singapore, the same folks now serve up stew dishes by Masizzim 마시찜 , which is also a famous Korean casual restaurant with stores all over South Korea. "Masizzim "is a combination of two Korean words: "masi" (delicious) + "jjim" (stew). Delicious stew indeed! The mini hot pot bubbling with chunks of slow-cooked meat might not come across as the most trendy of dishes, but is certainly one that gratified our tongues and tummies with much comforting warmth and appetizing yumminess. Karafuru Desserts カラフル @ Jalan Klapa ~ A Japanese-Inspired Café Serving Sweet Sweet Sweet Éclairs. Our experience at Karafuru Desserts カラフル was so so so sweet (literally), my friend weaned herself from anything sweet for the next couple of days. "Karafuru" means "colorful" in Japanese katakana-form, and most aptly describe the rows of vibrant-hued éclairs behind the display counter of this Japanese-inspired café at Jalan Klapa. Pretty éclairs, intricately-plated yogurt parfaits, aesthetic-pleasing minimalist white interior, this is another of those places that highly attract creatures of the visual-loving kind (yes, my friend and I are one of them). Most photos taken here would probably garner numerous likes on any Instagram feed. Effortlessly. Oriole Coffee + Bar @ Capitol Piazza ~ 1-For-1 Lunch Specials! What A Good Deal! 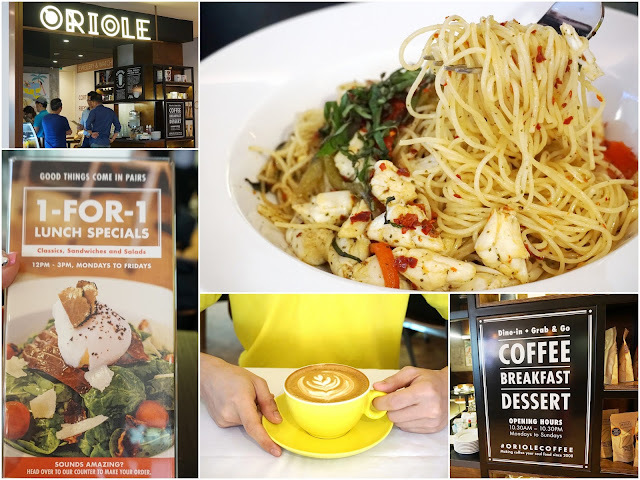 Founded in 2008, Oriole Coffee + Bar is one of the pioneers of Singapore's third wave coffee movement. Besides having their own coffee roasting facility, they also have a café outlet at Pan Pacific Serviced Suites Somerset, and recently opened a new branch at Capitol Piazza. We decided to stop by for cup of coffee after a less-than-stellar meal at MOS Café, and were pleasantly surprised to see there's a Weekday 1-For-1 Lunch Specials on their Classics, Sandwiches and Salads (available Mondays to Fridays, 12pm to 3pm). Feeling peckish for more food, we went for it of course! Pontini Italian Restaurant @ Grand Copthorne Waterfront Hotel ~ 5 Reasons To Go For Their Semi Lunch Buffet! You see, I've tried the delectable creations by head chef Daniele Sarno before, so we're pretty sure that constraining ourselves to yummy food is the last thing we want to do. Authentic Italian cuisine with a modern twist..... make that an endless supply. Won-won-wonderful!!! If you've yet to check out Pontini's Italian Semi Lunch Buffet which is happening every Saturday, as well as on Public Holidays, from 12pm to 3pm (Adults $58, Child $29), here are 5 reasons why you should do it soon! Plain Vanilla is now in town! Right smacked in the heart of Orchard Road! Look not for the bakery itself, but a fashion retailer named In Good Company in basement one of Ion Orchard (right next to the escalator). Even as we walked through the boutique storefront, my friend is still asking, "here have café meh?" Past the rows of wardrobe essentials and stylish staples for women, and you'd find yourself at a corner space that livens the nook with its bright orange wall and..... a display counter with lots and lots of freshly-baked goods! Look at the piping of those cupcakes. Unmistakably it's by folks from Plain Vanilla. Well Dressed Salad Bar & Café @ South Bridge Road, Chinatown ~ Hippy Vegan & Vegetarian Cusine! Someone asked: "Do we have to be well-dressed to go to Well Dressed Salad Bar & Café?" Haha the answer is "no". We were not thrown out though casually dressed, but were welcomed with a host of delicious vegan and vegetarian dishes. The carnivore in me did not protest the no meat meal at all, but instead was greatly satisfied with the refreshing offerings that rested light on the palate and tummy. In short, I was happy with what I've tasted at WDSB. Gyuu Yakiniku Grill Restaurant @ Emporium Shokuhin, A Food Shopping & Dining Destination At Marina Square! 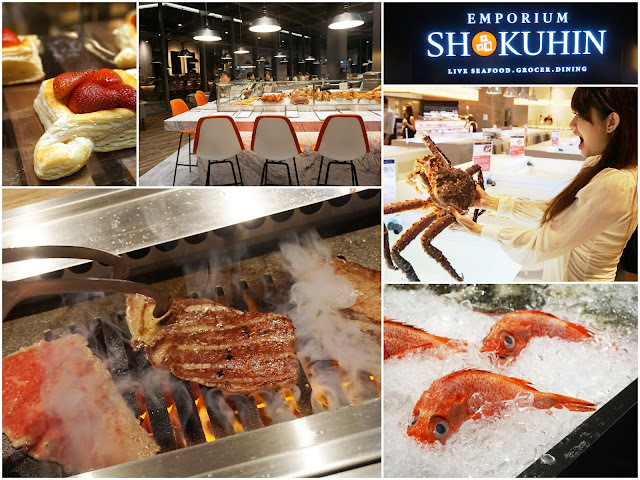 An exciting reason to visit Marina Square: Emporium Shokuhin! If the buzz has yet to reach your ears, here's sharing that Emporium Shokuhin (meaning "food products") is Singapore's first integrated Japanese food shopping and dining destination headlined by a gourmet grocer with live seafood market, beef dry-aging facility and 8 dining concepts. Wow! Recently opened in end-September, one can easily imagine how huge the space must be to hold all these concepts under the same roof. The walk around various stations took us more than 30 minutes. Of course we stopped quite a fair bit to take photos and gawk at the merchandise before having a delicious dinner at Gyuu Yakiniku Grill eventually hehee. Twins Korean Restaurant @ Craig Road, Tanjong Pagar ~ One Of The Best Korean Fried Chicken Around! "Nicole, can dabao (takeaway) the twins chefs for me please?" That was my friend's reaction when she learned that I was at Twins Korean Restaurant for dinner. She likes delicious wings, and maybe delicious-looking twins even more? Haha! It's already quite a well-known fact that Twins is opened by a pair of identical twins from Korea, both young, tall, good-looking and definitely equipped with cooking skills good enough to open up a restaurant offering a menu of perennial Korean favorites such as Fried Chicken, Tokkbokki (spicy rice cakes), Spicy Noodle Soup and Kimchi Pancake. Verdict: I love Twins' Fried Chicken Wings! The Halia Restaurant @ Singapore Botanic Gardens ~ Revamped Look & Menu! Restaurant in a garden and a garden in a restaurant. What an apt description for The Halia (meaning "ginger" in Malay) which has well-embodied this dining concept since its opening in 2001 in the lush Ginger Garden of Singapore Botanic Gardens. One of my favorite restaurants around, I was keen to check out their updated menu following the recent premises renovation. If you're visiting Halia for the first time, enter from Tyersall Avenue entrance which is just a short 5 minutes walk to the restaurant, and the single storey building will soon come into sight. I must say it still look as charming after all these years. Why would someone staying in the northern end of Singapore travel all the way to the island's remote eastern part just to eat zhi char in a nondescript, non-aircon coffeeshop located under a block of HDB flat in a sleepy neighborhood? Because reviews on Eastern House of Seafood Delicacy at Chai Chee Drive has been largely positive. Because friends matter more than distance, so to go the extra mile (literally) for lunch with them is okay. Thankfully, both the food and company were great! 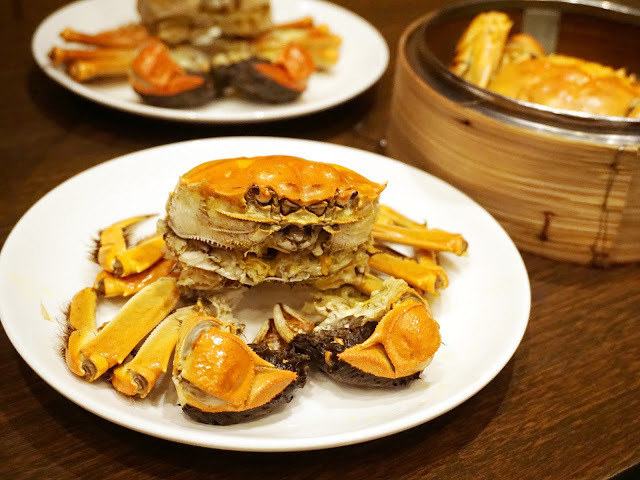 MOS Café Singapore Opens First Outlet At Raffles City Shopping Centre! Hello October! The first day of the month started with the official opening of Singapore's first MOS Café at Raffles City Shopping Centre! Best know for their burgers, popular fast-food chain MOS now introduces an expanded menu at their café. I've always been fond of MOS Teriyaki Chicken Burger ($3.55), Yakiniku Rice Burger ($3.90) and side treats such as MOS Chicken ($2.90), and is glad that we can still find these and more at their latest concept store.